BEES WELLNESS LOUNGE: Camping and Insomnia...what's the connection? 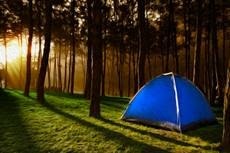 A recent article I read, "Could Camping Help Your Insomnia", gives hope to those who, like myself, have trouble sleeping . Though it would take some adjustment for those of us whose idea of camping means a cabin with full kitchen and amenities, perhaps trying the traditional way of pitching a tent for a week may be worth the overall outcome.